There are no his versus her problems in a marriage. There are one flesh problems. Your physical body is an excellent illustration of this. If your finger is hurting, your body is aching. If there is something wrong with your one flesh marriage, regardless of who is struggling, the whole body is struggling. The other day I was trimming some briars behind our fence in the backyard. I caught my arm on a few briars. One of the thorns broke the skin and made a slight laceration on my arm. My arm was hurting. It began to bleed. The pain would not go away, so I yelled at my arm. Anger was my way of “fixing” the problem. I criticized my arm because it was inconveniencing me. If only my arm would cooperate and not hurt, my day would meet my expectations. But it would not cooperate. It continued to hurt, and I kept stewing and sulking because of my non-cooperating flesh. I then had this wild idea. What would it be like to not have this arm? Would I be better off? My mind began to drift to other arms–better arms, as I thought what life would be like with an arm that did a better job at meeting my expectations. At our church meeting, I caught myself looking around to see what other arms were available. My mind wandered. I wondered. I fantasized ever-so-briefly about life with another arm, a wish gone awry. At the end of the day, I felt stuck with this old arm. Biff and Mable have been married for eight years, and you’d only have to spend a couple of hours with them to know things were not well in their marriage. They were like the man in my silly arm story. Except for the issues that were wrong with them were real, and the stakes were higher because marriage is not a fictional story. There is a disjointedness in their one-flesh union. Neither of them understands how they are ontologically connected and dependent upon each other. They’ve forgotten how they are no longer two people, but one flesh. There cannot be a dichotomy, schism, or fracture in marriage. When you see Biff, you see Mable. When you see Mable, you see Biff. They are just as one as the man and his arm are one. They are just as one as the body of Christ and the head, who is Christ, are one. Though there are many members in the body of Christ, we are one in the body. There are no competing parts. We all are on the same mission, working the same plan, using our gifts according to how God gives them while putting His name on display. Though the husband and wife have different capacities, personalities, strengths, weaknesses, and experiences, marriage is two people coming together to form one flesh for the glory of God. The body never says to the arm, “I do not need you.” There cannot be a division in a one-flesh union. Marriage is not a competition, but the assimilation of two people who present a dynamic picture of Jesus and His Church. This one flesh idea raises a few questions for all married people to consider. Are you and your spouse competitors or friends (John 15:15)? Is your spouse your best friend? If not, why not? How are you working to maintain unity in your body? If part of your body is rejecting you or if you’re rejecting part of your body, you will die or, minimally, the rejecting portion may need amputation. A body part not assimilating into the body is diseased. Marriage is similar. Spouses spend their entire lives blending into each other until they are entirely and joyfully one flesh, as much as they can be by life’s end. Becoming one flesh does not happen in an absolute complete way on the wedding day. That particular day is a good start, but it is only the beginning of the marriage marathon. On the wedding day, you hear the starter’s gun. The race and all its obstacles and joys are still before you. If you don’t understand this, you will be set up for a lot of disappointment as you embark on your conjugal journey. I’ve seen this many times with married couples that I have counseled. They fall into two groups. The “I didn’t know how” crowd was never informed, trained, or discipled for marriage. For example, these individuals may have been in a thriving youth group, but that time was not spent getting them ready for the most important thing they will ever do in their lives, outside of being born a second time. Marriage is where they will spend most of their lives and most of their energy. Marriage is more important than parenting because if the marriage is not right, the chances of the children being right are exponentially more difficult. Too many of these unaware newly married couples had parents who kept them preoccupied with other things. Sports and other things dominated their teenage years, while little (if any) time was devoted to teaching them how to be what they were going to be as adults. After their activities fade in their memories or their sport is nothing more than a dusty trophy, the novice couple enters the throes of a long and arduous marriage that they were never equipped to thrive. Other parents have the “myopic-college-view” as though college is an end all. Can I speak plainly here: I counsel more college graduates than any other struggling marriage demographic. I have spent most of my adult life counseling couples who were educated and successful but in miserable marriages. Nobody prepared these couples for marriage. Here are three typical responses I hear over and over again. I never knew. My dad never taught me these things and my church didn’t do it either. This “way” is all new to me. I had no idea how to lead and shepherd my wife. The things you’re saying are foreign concepts. These ideas are the first time someone took me aside and practically taught me what it means to bring the gospel to bear in my marriage. Another people-group are those who don’t care about leading or following well. Getting a wife was just one of the many “to-do’s” on their list of things to accomplish. For some individuals, getting married is better than being single, and being hitched was the beginning and end of their marriage goals. The similarity between this group and the “I didn’t know how” group is that nobody envisioned either group was for marriage. The former group was mostly ignorant while the latter group was primarily selfish. There is a slight difference. The uncaring man has the “conquer and move on” mindset. He got the girl, and now it’s time to pursue other trophies. He secures a job so he can populate his world with his dreams. He doesn’t give his wife a lot of thought unless he needs her to do something. He lives as though there is no need for ongoing marriage maintenance. His views are about himself while his wife is just like he is: a work-in-progress. His wife makes a similar mental misfire, thinking he will act like an adult. She assumes what an adult should be and maps that expectation over her husband. It does not dawn on her that he may have problems and is in need of her discipleship. It’s easy for a wife to misunderstand her full role in marriage. It could be she cared about the marriage during the early years, but at some point, she experienced weakened perseverance, and she turned to her children as an escape from her broken marriage dream. Both of these groups have a weak view of the doctrine of sin. They don’t see sin as cancer that is seeking to devour whomever it can tempt and lure (James 1:14-15). They misunderstand the nature of sin and their complementary roles in marriage. Christian marriage partners are co-inheritors of the gift of life. They are not competitors. They are continually assessing, observing, caring, teaching, and uniquely complementing each other for the glory of God. The maturing couple understands the nature of sin and their complementary roles in marriage. They see sin as their ever-encroaching adversary and the marriage as their God-given opportunity to defeat it together. This reality is why discerning couples are considerate, aware, caring, and eager to disciple each other. The husband does not assume everything is okay and ongoing maintenance is not needed. His wife is similar. She is considerate of her husband’s weaknesses and eagerly seeks to speak into those weaknesses, knowing they are not competing with each other. They are one flesh friends. There are no “his versus hers” in marriage. There is only one. I watched my wife go through three miscarriages. They happened to her. It was her pain, her disappointment, her fear. They were my miscarriages too. I did not feel and hurt the way she did. I have no idea of the physical, mental, and emotional agony of a miscarriage–at least not the way she does. But I hurt because she was hurting. I hurt because I lost something too. We are one flesh. When someone murdered my brother in 1997, my wife hurt along with me. She did not hurt the way I did, but she hurt because her husband was suffering. We are not two people, acting independently of each other. We are one body. Do you hurt when your spouse is hurting? What hinders you from entering into your spouse’s pain? What will it take for you to do for your spouse what Christ did for you (Matthew 18:33)? What is your biblical responsibility regarding your spouse’s sin? No, it’s our sin. She is not guilty of my sin and she does not repent of my sin, but she has a role to play because she is me and I am her–we are one. When I sin, she runs to my aid by calling me out and caring for me. She becomes my discipler. My confidant. Just like when the briar cuts the arm, the body comes to the rescue. Too many times when one marriage partner sins, the other acts like my silly story at the beginning of this chapter. The wife acts as though she is not part of the body and it’s the husband’s problem. This reaction is the Job’s wife syndrome: The non-sinning spouse gets mad when the other spouse sins (Job 2:9). Ironically, (and biblically) this means both of them are sinning. When two people respond sinfully to sin, they both are guilty before God and before each other. They both need to repent. It’s like cursing your arm when it gets cut. That’s weird. That’s your body. You shouldn’t get mad at yourself when something happens to yourself. Are you following my logic? It is biblical insanity to get angry at your spouse when he (she) sins. When part of the body rejects another part of the body, you have a problem. You better call a doctor or, in this case, if you’re unwilling to repent, you better call your pastor or elder or small group leader or some other competent helper. You need help. There is something wrong with your body. Are You a Rescuer or an Accuser? Are you a rescuer and restorer or are you a critic and condemner? You’ll never be more tested on this than when your spouse does something that hurts you. Your spouse is an instrument the Lord uses to measure and mature you. We see this in Paul’s warning about a person in sin and a person who helps a person in sin. Take a look at these three verses and note how much time he spent talking to the helper rather than the person in sin. Paul gives us seven words (underlined) regarding the person in sin. He gives us forty-seven words for the person who is supposed to help the person in sin. This difference is no small matter. We should read this like a warning. If you don’t see your spouse’s problem as your problem and if you don’t actively become part of the solution, your marriage will go to places where it cannot recover. Paul warned the restorers to guard their hearts against this kind of self-deception, and if you do, you will fulfill the law of Christ, which in this verse means bearing each others’ burdens. What are some areas where your husband is weak and needs your help? What areas regarding your role as a wife are weak and need help? When your spouse sins, are you envisioned and ready to restore your spouse? Or, are you more apt to sin against your spouse, similar to my silly story at the beginning of this message? Are you a burden bearer for your spouse? What ways do you need to change to be a burden bearer? 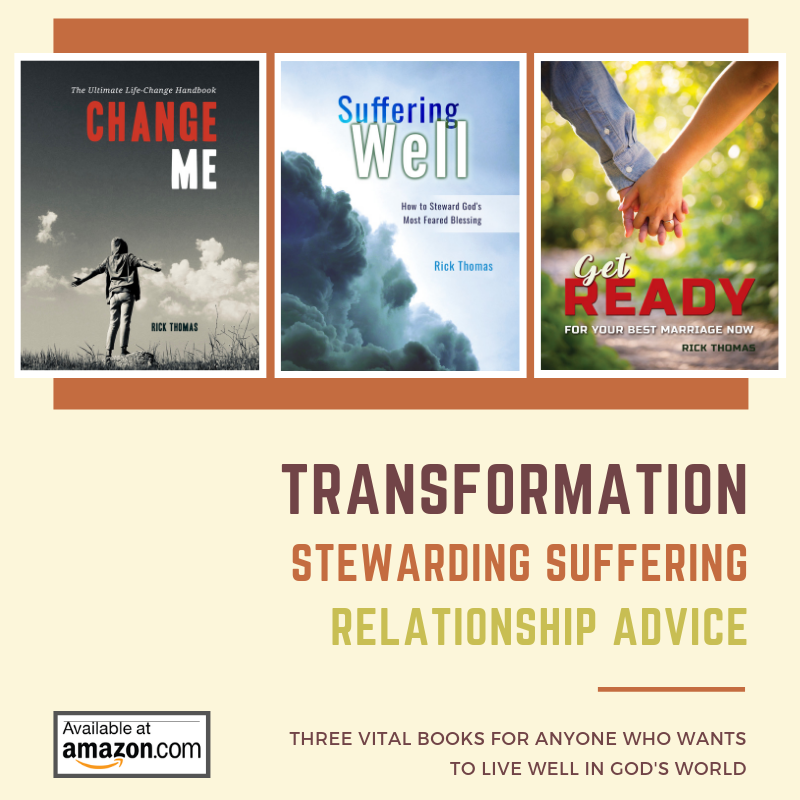 Will you write out those ways and talk to your spouse about how you need to change?